Frank Lampard and Andrea Pirlo have not joined New York City FC just for the money, according to the club's sporting director Claudio Reyna. 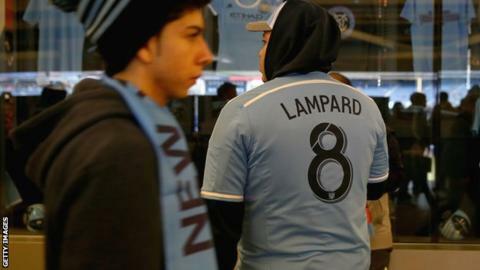 Lampard missed a planned debut in Sunday's 4-4 draw against Toronto FC with a calf injury. Thirty-six-year-old Pirlo, who still wants to be a part of Italy's Euro 2016 squad, is likely to play for the first time when NYC FC entertain Orlando at Yankee Stadium on 26 July. "We are starting a club from scratch," said Reyna. "It is not just about bringing great players in. We are trying to establish a culture and a foundation for the way we want to train and act around the changing room. "At this stage, that is as important as the result we get on a weekend. "These guys are experienced. They are mentally very strong. That is why they have been as good as they are for so long. "That will supersede their age." How are New York City FC doing in the MLS? Chosen as an expansion club in May 2013, NYC FC became MLS' 20th franchise and launched at the start of the 2015 season. They are part of the City Football Group founded by Manchester City owner Sheik Mansour, and have sister clubs in Melbourne and Yokohama. They have the same sponsor - Etihad Airlines - and also wear sky blue shirts. On 6 July, the club announced Pirlo had joined them from Juventus, becoming their third 'Designated Player' - each club can sign up to three players whose wages exceed the salary cap - alongside Lampard and Spain World Cup winner David Villa. NYC FC began their debut campaign with a 1-1 draw at Orlando on 8 March and beat New England Revolution in front of 43,507 in their first home game at Yankee Stadium the following week. Results since then have been patchy and the 4-4 draw with Toronto left them second bottom of the Eastern Conference, three points off a play-off place. Crowds remain good - they attracted their highest attendance, 48,047, to the 'derby' with New York Red Bulls on 28 June and their average gate of 28,785 is only beaten by Seattle Sounders (40,236) and Orlando (34,005) in MLS. "There is a long way to go but New York is the most diverse city in America," said first-time fan, Scott Carey, 23. "That will jump start it." Are they making an impact in New York? Local shopkeeper Saeed Abbad is impressed. "When they get big crowds - like the Red Bulls game - the atmosphere is exactly the same as when the Yankees are playing," he said. "Remember, the Yankees have been going for 114 years. The soccer team has hardly been here for that many days." "New York City won't do anything for football in this country," said Cody Kaczetow, 23, another first-timer. "It is not going anywhere in terms of how people respect it. It will probably still be the same when I am 80. "Kids who play soccer will still get called 'foot fairies' at school and baseball will remain 'America's pastime'. I think as a nation, we are too stubborn to change that." "We have had some challenges and some difficult patches, which were to be expected from a new franchise," he said. "But if you take a step back, in a little over two years we have created a new club to compete in a very difficult league. "We recognise a need to improve. But, to capture an audience, create an excitement and get people behind the team the way we have done in such a difficult market, has been remarkable. "It proves there is an appetite for football in New York City." How long are they going to be playing in a baseball stadium? NYC FC are committed to using Yankee Stadium for three seasons. The location is not without its issues. Whilst fans are reasonably close to the action on three sides of the famous stadium, they are a long way from the pitch on the dressing room side, where the pitcher's mound, batters' boxes and coaches' boxes are located. And the restrictions mean that, at 70 yards, the pitch's width only just meets Fifa's international regulations. But they will stay there until a new home is found - a new home that, unlike that of the Red Bulls, is in one of New York's five boroughs; Manhattan, Brooklyn, the Bronx, Queens and Staten Island. "Red Bulls are New Jersey. I grew up in New Jersey. Anyone who comes from there knows it is not New York. They are proud residents of a different state," said Reyna. "We want to be in one of the boroughs. In a short time we will have some updates to share but at the moment we are focused on playing here. "We are happy here. It feels like home. We have got used to the surface. We have got used to the dimensions. There are no excuses."